Now guess who has some HIDDEN BLOG-CANDY?? Yeap, yours truly! This next photo is my candy and what you could win from me!! It can be YOURS!!! 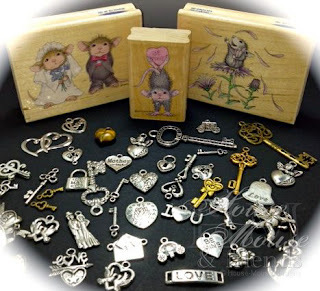 All you have to do is leave a comment, FOLLOW this Blog AND the HOUSE-MOUSE & FRIENDS MC BLOG! I will be choosing the Lucky Winner on February 12th! From here, you will want to continue the HOP at Christine Craig's BLOG. If you should get lost along the way, here is a complete list of DT's participating. America, this card is GORGEOUS! Love the heart border too. Beautiful card for the love and Hearts theme. What a sweet card - love all the layers and the red hearts. America, this is so adorable hun!! Love how the hearts and images pop off your card and what a great color combo too! all those lovely die cuts and cut borders are fantastic! Awesome heart charm, charm lady! This card just breathes LOVE! This is stunning America, just love the colors and the details. This is totally gorgeous, an adorable image and love your design. Very striking! Awesome card, your cards are always awesome. Great prizes I will be doing some hopping to check them all out. And then you America... Oh you always leave me in awe. Your layout is a fabo! I like the way you created your heart charm for lack of a better term, totally stealing that idea. ;0) Beautiful coloring, love the punched heart border. Gorgeous! oh wow stunning card America! this is such a sweet, adorable card. That house mouse image is darling! Thanks for joining in this week's challenge at DRS Designs. im on the blog hop. absolutely gorgeous cards from the dt members and what fab prizes. catch you again soon! Love your card, just adorable! Thanks for joining us this week at Sweet Stampin! What a wonderful card! Love those little mice and their message of love! I have a few House Mouse stamps, but I sure would love to have more. That bride & groom stamp is so cute, and it would be perfect as my son just got engaged a couple of days ago. Keeping my fingers crossed!!! wow what a fabulous card america, beautiful with all those hearts. America, You card is so very cute. I love all of you embellishment especially that littel heart. You did a beautiful coloring job on those meeces. I'v never thought about putting blush on them. Thanks for a terrific idea. Enjoy your week. fabulous what a card!!! love the pretty colours!!! and that image is gorgeous!! Stunning card with a lot of wonderful details, America. The heart punch you have used is really lovely. Hi America sweet meece sister..awww how cute is this couple? great punchwork.. especially the MS heart corner work border..LOVE it all(sorry for the pun) great take on my chall theme. Amazing prize - your card is out of this world - I love it!!!!!! OMG! I just LOVE this card! Great job, Just getting started on the hop, and you've set a high bar for all the others. What fun!!!! Absolutely BEAUTIFUL America, LOVE it...soooo sweet! Thank you for entering our final challenge at Die Cut Dreams, great to have you as a participant! Hope to see you around blogland in the future! This hop is a great idea and your card is a great opening as first stop on the hop! As always: your coloring is so cute, I love it! And I like the way, your papers matching the coloring and the meaning of the image. Great work and great prices, thank you. This is so beautiful! Love all the wonderful details and of course, the image and all the pretty hearts. Gorgeous. I was posting my card at Die Cut Dreams and saw your lovely card. I just wanted you to know how pretty it was. I am a new follower of your lovely blog. such a happy card..makes me smile. Love the dies cuts, borders and punches! Gorgeous combination and card!! This is a very lovely card! Gorgeous America - you have used this image brilliantly - your details, design and colours are just stunning!!! Way too cute! Those mice couldn't be any cuter! Great coloring too! Thanks for visiting and playing at DRS Designs - Good Luck in the contest! Uff, the times flys by. I would like to thank you for your big surprise for Christmas an first. You made me realy speachless with this many beautiful embellishments and awesome papers. Some of them I allready used on my last cards. Love your card too. This image is so cute I had to use the same :). Great colours and this dimensionwork. I just started the Blog Hop and I am enjoying every card and every stop. We have so many talents on our team and it is a plessure to see all the new works. What a wonderful card - everything a Valentine should be! Beautiful! Wishing you a happy day! Oh my gosh!! this is one stunning card America, I love all the punchwork, colour scheme and those sweet little mice. Fabulous challenge and prizes too. I'm off to Hop! Fabulous card, very striking colours. Amazing cards and loving all the dei-cuts....one of my weaknesses. Oh WOWWW what a fab card! Love all the embossing, punching and die-cuts.... and such fab colouring too! Thanks for joining in the last challenge over at Die Cut Dreams.... good luck with your entry! Love all your lacey details! Great colouring too. Love you fun and cute card. Great work on the details especially with the lacey part. Really adorable. What an absolutely adorable Valentine! I love all the heart borders, bling and of course the biggest heart of them all! So sweet! Hi America! That is one truly gorgeous card!!! Thank you for the inspiration. This was my first time entering a card at House Mouse & Friends. What fun! Hello America! This is just ridiculously adorable! I love the layout and how you used all and the colors are just FAB! I love your card ! Just a fantastic image. Great hop ! Wow I so need that stamp absolutely stunning card, off on the hop. America this card is amazing as usual! Your layering can't be beat! LOL! Love the little red hearts and those darling mousies!! Thank you so much for joining us in our Love and Valentine’s Challenge this week at Paper Sundaes! Hi, America! I love the red and whites and the little embossed hearts on this very cute card! ADORABLE!! I love all the details and layers - a perfect way to start the hop! Thanks for the chance to win - so exciting!! Beautiful card, America. Love the layering & all the details. What an amazing card! Very super nice!!!!! Oh your card is absolutely precious, Who doesn't love the house mouse!! The dies and punches you used are awesome!! Beautiful work!! What an adorable card! Gorgeous border, precious House Meeses. Love is definitely in the air. Stunning card! I love the lacy feel of the whole card! Thanks for joining us at Dream Valley Challenges. What a great card for the first stop in the blog hop. Gorgeous! Super sweet card Miss America, you rocked the heart challenge! I'm hoping to get my card made and posted this weekend. Off to hop. Wow this is totally gorgeous, loving all the die cuts. Thank you for playing in the final challenge at Die Cut Dreams. This is so gorgeous America. Adorable and comical at the same time. Great card. It's so cute. Especially like the heart border. Thanks for joining us at Sentimental Sundays. Please join us again soon. Oh my, America, this is Valentine heaven! This is really eye candy! What a great Valentines Card. All the details and layers combine to make this really special - but then all your cards are wonderful!!! I feel inspired - off to look at the other cards and then I want to make one too!!! Hugz! those mice are cracking me up, how come the ones that get in your house never look this cute? your card is stunning. thanks for playing with us at PIO. Your card is fabulous! I just bought this stamp and haven't used it yet. I can't wait to use it for this challenge! Gorgeous card America. Looks fabulous in red and white. Wowww, what a lovely card. Nice details and a lovely stamp. A beautiful card, so much detail, and it stands out. This is so gorgeous America, I love all those layers. Hopping on. Wow, this is just so cute! Thank you for joining Di's DigiDesigns challenge. Wow! Stunning card - love all your details and the way you have 3D'd those cute mice. What an amazing card! You always rock the House Mouse crew. This card is so great! What fun. I made my card last night and my 21 old daughter had so much fun looking at all the images and cards on this challenge. She really wants the tanning mice! Great blog hop - what fun! Thanks for all you do!!!! Wow, there is so much detail on your card. How beautiful for these cute house - mouse guys.. Love the coloring on your mice. Thanks. this is amazing!! Thank you for the Inkspiration . 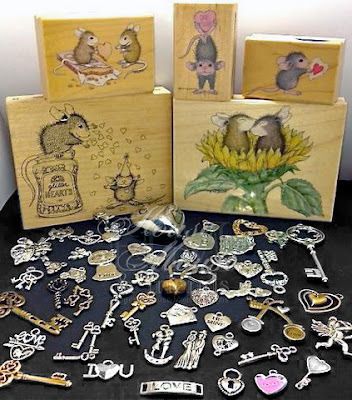 Love all the house mouse images and you always do an awesome job on yours. Beautiful card, america. Such a sweet image. gorgeous card !love your style ! very sweet card wonderful job. Lovely card! And I so love the heart-border in the bottom! I just love all the different die cuts on your card. I need to try that myself. I love what I see but when I do it, it always feels like some spastic monkey went crazy. I love the mice, the bling, the ribbons, the colors, the everything about your card. I LOVE the attention to detail in this card--the embossing, the lacy die cut borders, the bling, and the bows! And of course, your coloring is fantastic. Amercia -- Great card! Love your site! I don't know why I never thought of doing this image in red and white. It is gorgeous. You always make the prettiest cards. Red and white are best when paired together. It's so gorgeous! Great card. I'm going to try making my own card too. Thanks for posting this one.